In her opening speech recently at the High-Level Segment of the Basel, Rotterdam and Stockholm Conventions’ Triple COPs Ms. Maria Helena Semedo, FAO Deputy Director-General,Climate and Natural Resources, reiterated the message that “Food is the most basic human right, yet nearly 800 million people still suffer from hunger in the world. For the most part, they live in rural areas of developing countries and are involved in agriculture. Half a billion smallholder farmers ‐who produce 80 percent of the food supply in their countries – are struggling to make a living. The world’s poor and hungry are most vulnerable to the adverse effects of hazardous pesticides, chemicals and wastes that are the focus of the Basel, Rotterdam and Stockholm Conventions. Growth in the agriculture sector remains one of the most cost‐effective means for developing nations to reduce poverty and end food insecurity”. The Rotterdam Convention Secretariat started its cooperation with Lusophone African countries – Países Africanos de Língua Oficial Portuguesa (PALOP) in 2016. 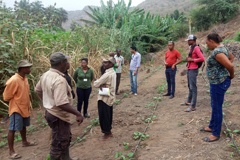 In 2016 and 2017 technical assistance activities on hazardous pesticide formulations, pesticide poisoning, and vulnerable groups were carried out in Cabo Verde, Guinea Bissau and Sao Tome and Principe. In March 2017, the General Direction of Agriculture, Forestry and Livestock (DGASP) of the Ministry of Agriculture and of the Environment of Cabo Verde officially requested technical assistance support to promote the use of alternatives to hazardous pesticides and start the process of strengthening Farmers Field Schools for irrigated agriculture and for vegetable crops in the archipelago. Fulfilling this request, Nadia Correale, Social Protection and Community Development specialist of the Rotterdam Convention Secretariat based in Rome, undertook a mission in Cabo Verde from 25 June to 2 July 2017 in the framework of a European Union project for the implementation of the Convention. A component of this project is explicitly dedicated to the collect and use of good field data as a solid base for rational policy decisions. Farmers were interviewed on their experience with Integrated Pest Management and with Farmers’ Field Schools (FFS) as a form of association of rural communities and as potential best tool to continue to use IPM approach. An intial map of main crops and areas, agronomic technics and a crops calendar was prepared as the basis to understand how to strengthen the national capacity in using less pesticides and introducing alternatives with the limited funds available. What are Farmers Field Schools? if I discover it I own it for life”. FFS focus on basic processes through field observations, season-long research studies, and hands-on activities. It has been found that when farmers have learned about basics, combined with their own experiences and needs, they make decisions that are more effective. The final aim is to grow healthy crops, conserve natural enemies of the main pests, observe fields and crops regularly, based on the premise that farmers are the best experts. The Rotterdam Convention works on the identification of alternatives to the use of hazardous pesticides, thus IPM and FFS are very efficient tools among smallholder farmers and rural communities in general. One part of the RC Secretariat is based in FAO in order to make the best use of the long time expertise in pesticides risk reduction, IPM and participatory approaches among agricultural communities. A FFS Guide has been prepared by FAO in 2016 and now is available also in Portuguese, click here to download the guide. The Rotterdam Convention Secretariat continues its efforts to make agriculture more sustainable by contributing to detoxifying the soil, the water, and the air from hazardous substances such as pesticides with the final overarching objective to protect both human health and the environment.